Kavi Ade performs at a Rainbow Week event on Thursday. The spoken word poet read some of their work and discussed their experiences with race, gender and politics. Spoken word poet Kavi Ade said after they came out as queer and transgender, their mother did not speak to them for years. Ade, who uses “they/them/their” pronouns, performed some of their poetry and spoke Thursday in Swift Hall. Rainbow Alliance hosted the event, which drew a crowd of about 20 people, as part of its annual Rainbow Week programming. Before the performance, Ade led a writing workshop at the Black House, discussing how to write poetry about social justice and activism, Rainbow Alliance co-president Emily Zaniker said. As a black, transgender and queer person, Ade said they find it difficult to separate the most important parts of their identity — though people often ask them to try. 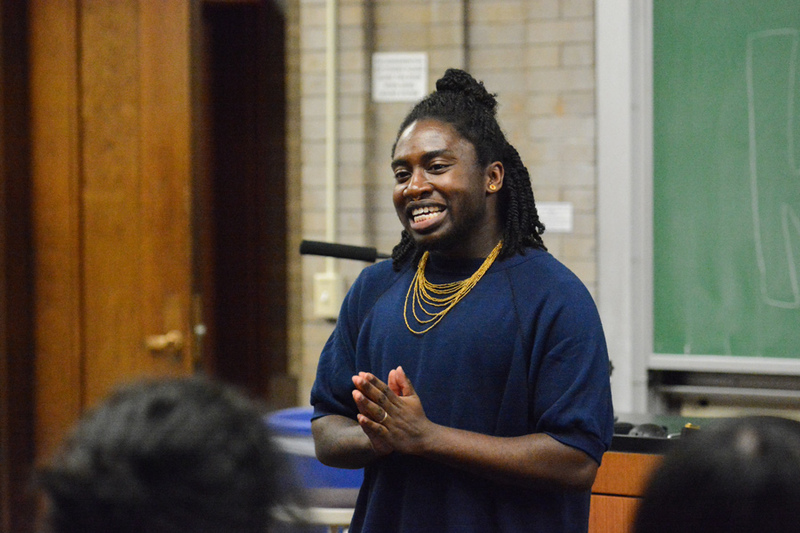 While reading their poetry, Ade discussed a variety of their experiences: joining activist collective “In Defense of Black Bodies,” coping with the suicide of a close friend and processing the results of the 2016 presidential election, after which they said they did not leave the house for three days. Ade also read from their “gender journal,” which they said they use as a means of expression after facing problems related to gender, especially being misgendered. They recounted an experience in Paris, when a French woman persistently asked them if they were a man or a woman. For Ade’s mother, the discomfort with Ade’s identity is more about what other people think than about personal prejudice, Ade said. For example, Ade said their mother will use their preferred pronouns around the house, but reverts to female pronouns when family visits. When dealing with “problematic” people, Ade said it is important to recognize that not everyone is “starting from the same place” of understanding. However, they said they won’t waste time trying to teach people who are unwilling to listen, and encouraged audience members to “bless (themselves) with the block button” if necessary. SESP junior Rebecca Nelson said she enjoyed Ade’s work, adding it was “powerful” to hear from someone with a different background. Zaniker said she hoped Ade’s work showed students the “power of art” as a way of activism. Rainbow Alliance invited Ade to speak because the group was interested in how Ade explores the intersection of different identities, the Weinberg junior said.